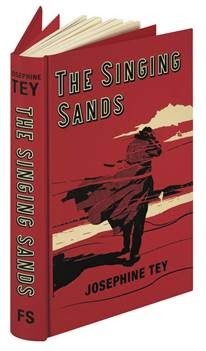 This Folio Society edition of Josephine Tey’s The Singing Sands breathes new life into a piece of classic crime writing. The new hardback features the eminently stylish illustrations of Mark Smith, which perfectly capture the book’s atmosphere of quiet suspense. One of these enigmatic drawings appears on The Singing Sand’s cover, which is bound in red buckram. In her newly commissioned introduction, the critically acclaimed crime writer Val McDermid explores Tey’s enduring popularity among readers and novelists alike. She also comments on her unconventional characterisation, including Grant’s ambiguous character and his susceptibility to the forces of ‘Unreason’ – both uncommon traits in a golden-age detective. For McDermid, Tey was the bridge between that era and contemporary crime fiction, opening up the genre for writers such as Patricia Highsmith and Ruth Rendell. Like the earlier Brat Farrar and The Franchise Affair, Tey’s 1952 novel is a classic mystery, but one that is unusually sensitive to the frailties and oddities of human psychology. For over 65 years The Folio Society has been publishing beautiful illustrated editions of the world's greatest books, in the belief that the literary content of a book should be matched by its physical form. With specially commissioned and researched illustrations, many Folio editions are further enhanced by introductions written by leading figures in their fields: novelists, journalists, academics, scientists and artists. There are hundreds of Folio Society editions currently in print, covering fiction, biography, history, science, philosophy, children's literature, humour, myths and legends, and more. Exceptional in content and craftsmanship, and maintaining the very highest standards of fine book production, Folio Society editions are created to last for generations. Folio Society titles can be bought from www.foliosociety.com, by telephone on 0207 400 4200 or by visiting The Folio Society Bookshop, 44 Eagle Street, London, WC1R 4FS.